The Western Michigan Broncos football program represents Western Michigan University in the Football Bowl Subdivision of Division I and the Mid-American Conference (MAC). Western Michigan has competed in football since 1906, when they played three games in their inaugural season. In 1927, WMU joined four other schools (Central Michigan University, Eastern Michigan University, Ferris State University, and Wayne State University) to form the Michigan Collegiate Conference. Western Michigan then moved to its present conference in 1946. Prior to 1939, Western Michigan's athletic teams were known as the Hilltoppers. Western Michigan's football team has had 15 head coaches in its history, with current head coach, P. J. Fleck being named to the position December 17, 2012. Fleck replaced Bill Cubit, who held the job from 2005 to 2012. WMU had a huge turnaround in Cubit's first season, going from 1–10 in 2004 to 7–4 in 2005. The 54.5% increase marked the highest in Division I-A between the two seasons and garnered Cubit the 2005 MAC Coach of the Year Award. Cubit was also the only first-year Division I-A head coach to take his team from a negative point differential in 2004 to a positive one the following year (−188 to +12). WMU was also one of eight football teams that was bowl eligible but did not go to a bowl game. WMU's main rival is the Central Michigan University Chippewas and they play for the WMU–CMU Rivalry Trophy. As of 2016, the Broncos own a 48–37–2 advantage in the series. In 2002, Western Michigan won the rivalry game at Central Michigan for the first time since 1973, snapping a 12-game winless streak (0–11–1). Western Michigan University played in the inaugural International Bowl in 2007 in Toronto, Canada. It did not win a bowl game until it defeated Middle Tennessee, 45-31, in the 2015 Bahamas Bowl. The following list is the current WMU coaching staff. From Western Michigan's first season of football in 1906 until they joined the MAC in 1949, WMU compiled a 187–87–12 (.675) record, going undefeated six times, in 1909, 1913, 1914, 1922, 1932, and 1941. During that stretch, Western Michigan had only seven losing seasons, and only once had back-to-back losing records. In 1922, the team finished 6–0 while outscoring their opponents 160–0. The early dominance of the Hilltoppers was led by quarterback Walt Olsen and running back Scott Dunlap. In 1916, Olsen led the country in scoring with 17 touchdowns and 36 extra points. Olsen set a school-record with 8 touchdowns in a single game that season. Dunlap also set a team record with 19 touchdowns. The only loss in 1916 was to Notre Dame when George Gipp completed a 62-yard drop kick, the longest in football history. In 1939, WMU began playing at Waldo Stadium. Coinciding with the opening of the new stadium, the Hilltoppers changed their name to avoid confusion with athletic teams at Western Kentucky University and Marquette University. A contest was held to come up with a new name and assistant football coach John Gill suggested "broncos." In support of the decision, the W Club's semi-annual publication, The Hilltopper, was renamed The Bronco. Western Michigan joined the MAC in 1948. At that time, the MAC consisted of Miami University, Ohio University, University of Cincinnati, Western Reserve University, and Butler University. The Broncos won their first conference game 26–0 over Western Reserve and finished with a 6–3 record, good for second place. However, WMU would finish second or higher only 4 times in the next 39 years, compiling a 102–141–8 (.422) conference record in that stretch. In 1961, Western Michigan finished second in the MAC with a 4–1–1 record, one-half game behind Bowling Green State University. Despite the second-place finish, WMU was invited to the Aviation Bowl in Dayton, OH. In freezing rain and snow, the Broncos lost to the University of New Mexico 28–12. 1966 saw a 7–3 season and WMU's first MAC football championship, which it shared with Miami. That season, tackle Bob Rowe won his second MAC Lineman of the Year Award. Rowe would go on to a 10-year National Football League Several players from the 1980s also played professionally including Duane Wilson USFL, John Offerdahl and Tom Toth for the Miami Dolphins, and Mark Garylchk. Tom Nutten won a super bowl ring with the St. Louis Rams. Jack Harbaugh's first team went 7–2–2 and were second in the MAC. The defense that year was among the best in the nation. In December 1986, Al Molde was hired to replace Jack Harbaugh. Molde had spent the previous four seasons as head coach at Eastern Illinois University where he led the Panthers to two playoff appearances (1983 and 1986) and a top 5 national ranking in 1986 (his 1986 squad was led by quarterback Sean Payton, current head coach of the NFL's New Orleans Saints). The hiring paid immediate dividends, as Molde's first WMU squad finished the 1987 season 4–4 in the MAC (5–6 overall) and was much more competitive than recent WMU squads had been. Molde's first notable win came in the MAC opener, a 34–27 win at Bowling Green State University which was only two seasons removed from an 11–1 season. In only his second year, Molde orchestrated the single greatest season in WMU history, leading the Broncos to a postseason bowl game for the first time since 1961. The 1988 season began with five consecutive dominating wins over the University of Wisconsin–Madison, the University of Toledo, Illinois State University, Bowling Green, and Miami University by a cumulative score of 177–65. The win over Wisconsin in Madison was WMU's first ever over a Big Ten team. After a midseason home loss to pre-season MAC favorite Kent State University, WMU found itself with little margin for error during the season's home stretch as they faced in-state rivals Eastern Michigan University and Central Michigan University in back-to-back contests. In the 31–24 win over EMU, the Bronco defense managed a goal line stand, stopping EMU on the 1 yard line on the last play of the game, to preserve the win. The following week against CMU, a then-record crowd of more than 32,000 jammed Waldo Stadium to see WMU rout the rival Chippewas 42–24, which stopped an 11-game winless streak in the heated rivalry dating back to 1976. That win set up a winner-take-all showdown in Muncie against Ball State University the following week. The winner would claim the outright MAC title and a berth in the California Bowl to face Big West champion Fresno State University. The game was played in soggy conditions and was a defensive struggle. Three field goals by John Creek along with an opportunistic defense carried WMU to the 16–13 win, locking up the school's first, and only, outright MAC football championship. In the locker room after the game, Molde credited his players, coaches, and the Kalamazoo community for playing a part in helping to turn one of the MAC's worst programs into a champion in two short seasons. With the MAC title in hand, WMU played two more meaningless regular season games (losing at Northern Illinois University and winning the home finale against Ohio University) before heading to California for the bowl game. On December 10, 1988, WMU faced Fresno State in the California Bowl (the game was played at Bulldog Stadium in Fresno, which provided a huge home field advantage for Jim Sweeney's team). The Broncos entered as significant underdogs, and after falling behind 14–0 early, it appeared that WMU was outgunned. However, WMU reeled off 17 straight points to take a 17–14 lead at halftime and the game remained close throughout, as Fresno State had to rally for a 35–30 win. WMU wrapped up the 1988 season at 9–3, and the 1988 team remains the only outright MAC champion in WMU history. Several members of the 1988 team went on to play professionally at some level, including quarterback Tony Kimbrough, offensive lineman Kevin Haverdink, defensive lineman Joel Smeenge, wide receiver Robert Oliver, and running back Robert Davis. Graduation losses hit the 1989 team hard, and the team was one of the youngest in the MAC. WMU set an NCAA record with four losses by a single point (to Eastern Michigan, Ball State, Toledo, and Bowling Green), and finished the 1989 season at 3–5 in the MAC and 5–6 overall. The 1990 team bounced back to post a solid 7–4 campaign (5–3 in the MAC), and paved the way for a series of winning seasons in years to come. The 1991 and 1992 teams finished 6–5 and 7–3–1, respectively, setting the stage for two of the best teams Molde produced during his tenure. The 1993 season started off with a humiliating home loss to I-AA Youngstown State University. It was followed by a tough road loss to Purdue University, which left WMU at 0–2 and facing the prospect of a long season. However, the Broncos righted the ship and reeled off wins in seven in their last nine games (with one tie) to finish the year at 7–3–1 (6–1–1 in the MAC). Following the 1993 loss to Purdue, WMU embarked on its most successful run during the Molde era. In its next 14 games, a stretch that covered the remainder of the 1993 season and the first half of 1994, WMU posted a 12–1–1 mark. Due to a quirk in the MAC schedule, WMU and Ball State did not play head-to-head in 1993, which denied Molde's Broncos the chance to earn a second outright MAC title. Instead, Ball State finished 7–0–1 in the conference, won the title, and received the subsequent automatic berth in the Las Vegas Bowl. Following his team's 14–14 tie with WMU, then-Bowling Green head coach Gary Blackney (whose team had played both WMU and Ball State during the season), remarked, "Western Michigan is by far the best team we've played in the conference." With nearly all of the starters returning from the 1993 team, the 1994 Broncos entered the season as MAC favorites. Early on, they did nothing to disappoint as they raced to a 5–0 mark with wins over Miami, Western Illinois University, Iowa State University, the University of Akron, and Kent State University. In October, WMU traveled to Mt Pleasant to face arch-rival Central Michigan. This game was a turning point for the WMU program, and many believe that this game was the first step in what turned out to be a controversial ending to the Molde era a few years later. WMU jumped out to a 14–0 lead, but CMU fought back and eventually held off the Broncos in a 35–28 win. The loss crushed WMU's momentum, as they had been knocking on the door of the Top 25 national rankings, and highlighted the one glaring weakness on Molde's resume. This loss dropped his record vs. CMU to 2–6, and he would end his career 3–7 vs. CMU. The following week, WMU's hopes of a MAC title ended with a 16–13 loss to Ball State. Around this time, team chemistry problems became public, providing a distraction to the team and putting additional stress on the already lukewarm relationship between Molde and WMU's administration, most notably then-WMU president Diether Haenicke. WMU finished up the 1994 season a disappointing 7–4 (5–3 in the MAC). The 1995 season provided a fresh start after many of the disgruntled players from the 1994 team were kicked off the team or graduated. Following a 1–3 start, WMU rebounded to win six of its last seven games, with the lone loss at 16th-ranked Auburn University. The season was highlighted by a 48–31 win over CMU. Following the 1995 season, Molde was promised a contract extension by the WMU administration. By this point, Molde was working for his 4th different athletic director since coming to WMU. Molde entered the 1996 campaign with an overall record of 60–38–2, and was the longest-tenured (but among the lowest-paid) coaches in the MAC, but still no contract extension. After a loss to a nationally ranked University of Wyoming team (led by former Purdue head coach Joe Tiller) dropped the young WMU team to 0–7, the WMU administration announced that Molde's contract would not be renewed following the season. The announcement ignited a controversy among many Bronco fans who were unhappy with the way Molde was treated by WMU, particularly by Haenicke, who was ultimately responsible for making the decision. The Broncos closed out the season with back-to-back wins over Bowling Green and Kent State (with the players making a statement against Kent State by winning 76–27) to finish 2–9 (2–6 in the MAC). Molde finished his WMU career with an overall mark of 62–47–2, having won WMU's only outright MAC title, finishing 3rd or better four times and in the top 4 in the conference in 6 of his 10 seasons. At the time of his departure, he was among the top 10 in career wins (168) for active NCAA Division I-A coaches. Molde remains WMU's all-time leader for wins, tied with Bill Spaulding. Initially the Broncos' fortunes turned around immediately under Gary Darnell, who led WMU to an eight win season in 1997. The program had a seven-win season in 1998, including a surprising road victory over Vanderbilt, but also had a disappointing loss to Central Michigan. Building on the initial success of the Molde-era recruits, Darnell took the Broncos to back-to-back 1999 and 2000 MAC West Division Championships, falling both years to host Marshall University in Huntington, West Virginia. Because of the loss in the MAC Championship game, the program failed to become bowl eligible and see further post-season play. However, the disappointment wasn't enough to keep Darnell off the scouting list of BCS schools such as North Carolina, Rutgers, Missouri, Oklahoma State, and Virginia Tech. Some say the constant overtures from BCS programs to Darnell led to the program's progressive decline. The 2001 season saw the momentum of the program slowing, with a five-win season and a loss to Central Michigan. Slowing further in 2002, the program won four games, managing to defeat both Central Michigan in Mount Pleasant and Eastern Michigan University in the same season. 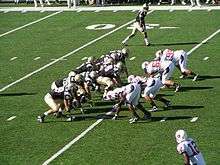 Some optimism was felt in Kalamazoo for the 2003 season, with high expectations for the program dashed quickly, after a blowout by Virginia, and losses began mounting after the Broncos lost to Ball State, Northern Illinois, Marshall, and Toledo. The 2004 season was a complete disaster. After a blowout of Division I-AA UT–Martin, the Broncos piled up nine uninspiring losses, only being competitive against Illinois and Eastern Michigan. But it wasn't enough, for the team lost 10 straight games and didn't beat a single Division I-A team. Despite a slight minority of fans and alumni who wanted to give Darnell one more season, the majority, including the administration, wanted change. The program's attendance in 2004 was abysmal and the program was deep in red ink, ultimately leading to Darnell's termination due to the losing season as well as an aggressive bid for the job by then-incoming Bronco coach, Bill Cubit. Regardless, Coach Darnell would go down as one of the best coaches to come through the Western Michigan program's storied history. WMU vs. Ball State, October 20, 2007. After the inaugural season of Bill Cubit in 2005, which was 7-5 and marked a significant improvement in the WMU program from 2004, the Broncos aimed to do well in the 2006 season. The team improved on its record with an 8-5 overall record and strong performances against Indiana and Florida State. In conference play, the Broncos' only setbacks were to Ohio and to a talented Central Michigan team (31-7 loss in Mt. Pleasant). WMU earned a berth in the International Bowl where it lost 31-24 to Cincinnati, coached by familiar foe Brian Kelly, in his first game as Bearcats coach. 2007 and 2009 were not-so-successful years for Bronco football, as the team registered 5-7 records in both seasons overall, but those years bookended an exciting 9-4 campaign in 2008, where the team started 6-1 and defeated Power 5 opponent Illinois (who had represented the Big Ten with a BCS at-large bid in the Rose Bowl the previous season) going into a week eight matchup at Central Michigan. One of only a handful of setbacks that year, WMU lost the battle of MAC West unbeatens 38-28. A few weeks later, WMU was on the losing end of Ball State cementing its perfect 12-0 regular season record. The seasons that year ended with a 38-14 loss to Rice in the Texas Bowl. It seemed as if WMU found the spring it needed for a rebound as the team posted a 6-6 record in 2010, though it was not selected for a bowl game. The following season saw the Broncos improve the win total by one as it posted a 7-5 regular season mark. A 44-14 demolition of rival Central Michigan (which snapped a five-game losing streak to the Chippewas) and a strong showing against then No. 24-ranked Illinois gave many plenty reason to be optimistic, but a continued string of losses to Northern Illinois and Toledo did not bode well heading into the Broncos match-up against Purdue in the Little Caesar's Pizza Bowl. Despite performing well offensively, the Broncos were exploited defensively and via unforced errors and failed to win their first bowl game with a 37-32 loss. Jordan White was named the school's first consensus All-American following the 2011 season. The 2012 season brought change to Kalamazoo, as the Broncos were forced to replace White. Receiver Jaime Wilson was who appeared to fill that void, but injuries plagued his time in Kalamazoo and he eventually left the program. Consecutive victories against Connecticut and rival Central Michigan were not enough to save Bill Cubit's job after the Broncos posted setbacks to rival Eastern Michigan and losses to continue losing streaks against Northern Illinois and Toledo en route to a 4-8 mark. The school terminated Cubit as football coach November 17, 2012, following the senior day loss to Eastern and relative unknown P. J. Fleck was named as his successor on December 18 that year. P. J. Fleck was named as Broncos head coach on December 18, 2012, which, at the time, made him the youngest Division I FBS head coach. He was named as head coach despite not having worked as a coordinator previously. Although Fleck was hired as offensive coordinator at Northern Illinois in 2012, but left after one day to take the receivers coach job for the Tampa Bay Buccaneers of the National Football League (NFL). Fleck's first season resulted in a 1–11 record. The lone win that season came at Massachusetts, which elected to attempt a two-point conversion late in a 31–30 contest. The conversion attempt failed and the Broncos hung on to win. WMU played rivals Eastern Michigan and Central Michigan closely in the following two contests before a season-ending blowout loss to Northern Illinois. Many had reason for hope during the subsequent off-season as Fleck turned in the highest-rated recruiting class in Mid-American Conference history. In 2014, the Broncos engineered a seven-win turnaround and posted an 8–5 record with strong efforts by many players including running back Jarvion Franklin, who earned honors as MAC Freshman of the Year and MAC Offensive Player of the Year. His debut showing of 163 yards and three touchdowns on 19 carries against Purdue was one of many strong performances that year. The Broncos, however, were unable to break losing streaks to MAC West powerhouses Northern Illinois and Toledo. Fleck, in the offseason, signed a recruiting class that was again best in the league, continuing to stock the cupboard for Bronco football. A year later, in 2015, WMU went against the second-toughest non-conference schedule in the country and the 33rd toughest schedule overall. It was a schedule that saw the Broncos play Big Ten Conference members Michigan State and Ohio State. Against Michigan State at home, the Broncos gained 365 yards passing, but were unable to stop the Spartans in a 37–24 loss. Against Ohio State, the Broncos ran and threw for 169 yards apiece for 338 yards of offense total against the then-defending national champion Buckeyes in a 38–12 loss. A few weeks following the Ohio State loss, the Broncos were unable to break their losing streak to Northern Illinois, but were able to break through against No. 24-ranked Toledo for their first victory over a ranked team in program history. On December 24, 2015, the Broncos captured their first bowl win in program history with a 45–31 win over Middle Tennessee in the 2015 Bahamas Bowl. Fleck, following the season, turned in another recruiting class that ranked at the top of the MAC. Continuing the upward trend on the field and in recruiting, 2016 is off to a positive start for Western Michigan as it has opened with a 11–0 record that includes wins over Big Ten opponents Northwestern and Illinois. It is the Broncos best start since 1941. It also includes a 49–10 win over rival Central Michigan. Western Michigan also beat Northern Illinois 45-30, snapping a seven-year losing streak to the Huskies. Defensive back and returner Darius Phillips has a punt return touchdown, kickoff return touchdown, and two interception returns for touchdowns. The fast start for the season has also been recognized by the Coaches Poll as it bestowed the first formal ranking of the Broncos in program history with a No. 25 spot in week six. A week later, the Broncos cracked the AP Top 25 for the first time in school history by being ranked as the No. 24 team in the country. Western Michigan is currently ranked No. 17 in the CFP poll. Following a 10-0 start to the season, ESPN's College Game Day announced the program would be broadcasting their weekly pregame show in Kalamazoo before the Nov. 19 game against the University of Buffalo. This marked only the second time a MAC school was featured by ESPN. The Broncos went on to defeat Buffalo, 38-0. Western Michigan University has been invited to play in eight bowl games in its history, compiling a record of 1–6 in those games. Rankings from AP Poll prior to game. Corey Davis, NCAA FBS all time leader in receiving yards with 5,205 yards. The following players played in the National Football League and WMU. Live coverage of Western Michigan University athletics are covered mostly by Bronco Insider through the school's athletics website, http://www.wmubroncos.com, or occasionally on http://www.mac-sports.com, the MAC's official website. Video is provided online for most WMU home football, basketball (men's and women's), baseball and hockey games, as well as some away games. Games can be viewed by purchasing them a la carte or by paying a fixed monthly or yearly subscription fee. The Bronco Radio Network (BRN) covers football, hockey and men's and women's basketball in various southwestern Michigan markets. In addition to video, the BRN audio feed is also available through the Bronco Insider service offered by WMU athletics. Bronco Review is a weekly radio show that reviews the recent ongoings of the Western Michigan University athletic programs. Bronco Review featuring the voice of the Broncos, Robin Hook, and head football coach P. J. Fleck, includes highlights and post-game comments after every WMU football game. The 30-minute show airs weekly on WLLA TV-64 on Thursdays at 7:30 p.m. and repeat each Saturday at 10:30 a.m.
Bronco Update is a daily update on issues that are immediately impacting the Western Michigan University athletic programs. ESPN also offers coverage of some MAC football and basketball games, as well as Comcast Local which is a regional network available to Comcast cable subscribers in Michigan, Indiana and Ohio which is where most MAC schools are located. Print media coverage is offered by the Kalamazoo Gazette and The Grand Rapids Press, as well as the school's daily newspaper, the Western Herald and http://mlive.com. The following table lists WMU's future scheduled non-conference opponents. ↑ "WMU Official Athletics Style Guide" (PDF). 2016-08-22. Retrieved 2016-08-27. ↑ "Football – 2014 Coaches". wmubroncos.com. Retrieved September 23, 2014. 1 2 "2011 Football Bowl Subdivision Records" (PDF). NCAA. p. 9. Retrieved November 24, 2011. 1 2 3 4 5 "2011 Football Bowl Subdivision Records" (PDF). NCAA. p. 15. Retrieved November 24, 2011. ↑ "2011 Football Bowl Subdivision Records" (PDF). NCAA. p. 12. Retrieved November 24, 2011. ↑ "2011 Football Bowl Subdivision Records" (PDF). NCAA. p. 2. Retrieved November 24, 2011. 1 2 "2011 Football Bowl Subdivision Records" (PDF). NCAA. p. 8. Retrieved November 24, 2011. ↑ "2011 Football Bowl Subdivision Records" (PDF). NCAA. p. 43. Retrieved November 24, 2011. ↑ "2011 Football Bowl Subdivision Records" (PDF). NCAA. p. 44. Retrieved November 24, 2011. ↑ "2011 Football Bowl Subdivision Records" (PDF). NCAA. p. 10. Retrieved November 24, 2011. ↑ "2011 Football Bowl Subdivision Records" (PDF). NCAA. p. 38. Retrieved November 24, 2011. ↑ "2011 Football Bowl Subdivision Records" (PDF). NCAA. p. 14. Retrieved November 24, 2011. 1 2 "2011 Football Bowl Subdivision Records" (PDF). NCAA. p. 59. Retrieved November 24, 2011. ↑ "2011 Football Bowl Subdivision Records" (PDF). NCAA. p. 63. Retrieved November 24, 2011. ↑ "West. Michigan Players/Alumni". Pro-Football-Reference.com. Retrieved November 24, 2011. ↑ "Western Michigan Broncos Football Schedules and Future Schedules". fbschedules.com. Retrieved October 21, 2016.